With yesterday’s announcement of RiME’s Switch release date, we wanted to take a moment to update all of you on what’s going on behind the scenes with development, why we couldn’t release this version in May with the other platforms, and what we’re doing to maintain platform parity. It’s a lot to cover, so let’s dive in. First, some history. The decision to go multi-platform was made a few months before it was announced last year. At that time, work was only underway on the PC and Xbox versions of the game. The Switch SKU had not yet entered active development. Work began in earnest on the Switch SKU in August of 2016. Given that this was a new console, we made a bunch of educated guesses as to the work that would be involved porting it over to the new hardware. Some of these predictions turned out to be right, and some of them turned out to be wrong. Unfortunately, we didn’t know that they were wrong until work started to “wrap up” earlier this year. The end result was that the port wasn’t living up to our quality standards, and we made the decision to delay the Switch version while we figured out what it would take to get things to where they needed to be. This involved a lot of testing various approaches and rework of art content. When we finally had a path forward, it became abundantly clear that we would need to delay again; the fixes were taking a lot of time to implement. Right now, the teams at Tantalus and Tequila Works are busy optimizing shaders, fixing bugs, and getting the game ready for our submission to first party review. It takes about two months when all is said and done to actually get the game on store shelves after that point. If all goes well, this will be the last time you hear from us on this subject. One final note, we’re doing everything in our power to preserve the gameplay experience from other platforms. This means that all of the optimizations we’re chasing do not involve re-working levels. We feel that this is the only viable approach for our players. RiME is a special game, and everyone should have the same experience regardless of their platform of choice. In fact, in order to ensure that the same level of narrative parity is in the game, we have built an achievement system into the game, so that the significance of certain key moments is not lost. With that, we’ll get back to it. 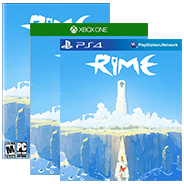 We thank each of you for your patience, and hope that you find the wait worth it when you have a chance to play RiME on the Switch - at home or on the go - this November.